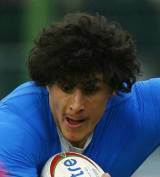 Italy back-row Alessandro Zanni made his international debut against Tonga during the 2004 autumn internationals. Having already represented Italy at age-grade and "A" level, Zanni established himself as a regular member of the Italy squad following his debut. He scored his only international try to date against Canada in 2006 and made his World Cup debut against New Zealand in 2007. Zanni represented Italy during the 2008 Six Nations and autumn internationals, whilst playing his club rugby for Calvisano in the Italian Super 10.